ASIDE: Now with a super duper spiffy pretty diagram thing! One of the things I most often read in regards to Twitter in it's early days was how it was going to destroy blogging as we know it, and as of 2009 I still come across people issuing similar gloom and doom scenarios. People were posting to their blogs less because Twitter was commanding their attention more and as a consequence the only direction for blogs to go was down. It was like taking a graph showing a trend for five months and extending it using the exact same gradient curve for five years. 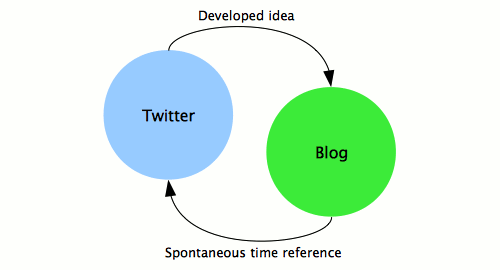 There is an element of truth to the idea that Twitter has displaced some blogging, but I believe it has had more to do with the spontaneous, real time nature of Twitter than a flaw with blogging. With Twitter I can post what's going on right at that instant whether it be through a snippet of 140 characters, or a photo I just took with my iTelephone, or a link to an interesting article. This means blogs stop being real time life streams and instead become the places where we hash out ideas in more detail and invite more serious discussion, while using Twitter as a reference to when we had the original idea. By having my friends on Twitter I've also noticed far more traffic to posts that I link to on it compared to if I just posted it here and left it at that. According to my server logs, Twitter is behind only Google services in originating traffic! Twitter and blogging support each other. In a few years when everyone has got sick of Twitter and moved onto the next fad I suspect there will still be brief idea posting services for this very reason. Will it be FriendFeed? Identica or Laconica? Or even a service like Tumblr that merges the best of both worlds? One thing is for certain, Twitter isn't killing blogs. Except perhaps the ones that only served as avenues to discuss what particular sandwich you were eating at any one time. Say, a grilled cheese sandwich. In that case, Twitter is more efficient for this any way.